Discussion in 'Guitars in General' started by steve10358, Jul 19, 2008. LOL. Do you know how many 1984 LP Customs you could buy for the BIN??? I usually just chuckle and move on but..I just had to comment via "Ask seller a question" And in reading the replys to questions asked already..I kinda feel sorry for the dude.....lol!!! hilariously confused....and VERY sure of himself. he's really excited about those tuners, isn't he? I really hope he gets a buyer at $30,000. 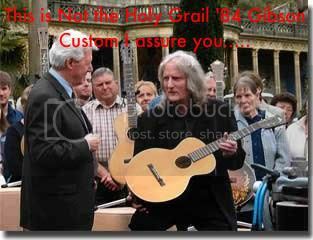 I might then have to sell some guitars on e-bay! Of course, mine don't have the cool tuners. LIVE PERFORMANCE TRAGEDIES, LIKE SNAPPED / BROKEN STRINGS.
" PATENTED PICK UPS " FOR A " RICH SMOOTH SOUND "
EVERYTHING INSIDE AND OUT IS ORIGINAL ! payment : Paypal doesn't allow transactions more than $5000.00 . As a result I can accept Wire - transfers . But I do require a $500 deposit to be paid immediately at the end of the auction . This deposit is non refundable . Though I would not mind getting $30,000 for my 1985 Gibson LP Custom, but its not a vintage guitar yet, i will have to wait a year or more for it to be. eBay ceased being a joke when the Chinese couterfeit guitars showed-up about 3 years ago...it's not funny anymore. But it has mother of PEAL inlays!! Well . . . You know . . . It does come with a Hardcase included! This is clearly one of those same guys you see selling their car as a very very rare "Ford Camero" - only one ever made in history! The dude is living in a fantasy world. He said in the Q&A that it was bought new in '84 for almost 4K.Yeah right. I worked in a music shop then and we sold new LP Customs for $1100. all day long.